The recent discovery by the CNC in Bois d’Arcy of a nitrate Swiss distribution print of Victor Sjöström’s Judaspengar (1915) is nothing short of sensational. Not only has a lost film by one of the greatest directors from the silent era been resurrected, thus giving us an additional piece to the reconstruction of the director’s early career and the evolution of cinema in Sweden, but Judaspengar is a remarkable film in its own right. Of the 30 films Sjöström directed during his formative years 1912-16, Judaspengar is only the fifth to survive. It depicts a worker out of job and struggling to provide for his sick wife and child. 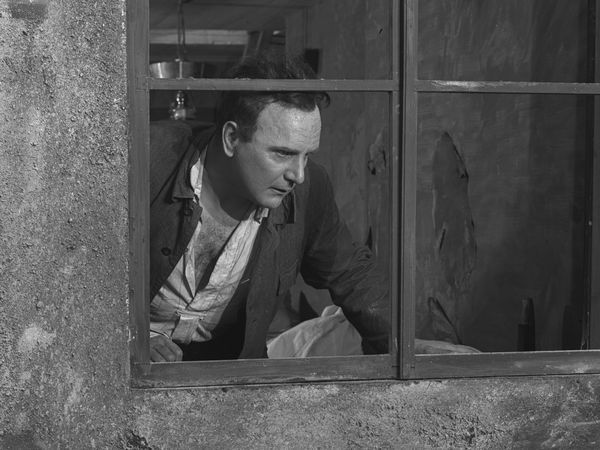 The film’s opening, a tracking shot through a window into the lodgings of the protagonist, shows a director who had already reached a high level of maturity and mastery of the language of cinema, and the film abounds with similar visually striking shots. The most famous of the early Sjöström films to survive is Ingeborg Holm (1913), and there are similarities between the two films, most notably in the treatment of space and the compositions, with action taking place in different depths of field within the same shot; in Judaspengar, Sjöström often uses windows in the background of interiors to show additional action. Other correspondences between the two films include the appearance of Death as the uninvited guest, setting the tragic course of events in motion. As in so many other Sjöström films, the presence of children induces the characters to abandon any thoughts of vengeance and bitterness, and the malicious acts of men are shown to be the result of external circumstances and not of any intrinsic qualities of evil. Judaspengar was shot in the summer of 1915 on location in Stockholm and in AB Svenska Biografteatern’s studios on the island of Lidingö just east of the city, and was released in November the same year. The film’s original length was 827 metres, but before the domestic release it was cut by the Swedish censorship authorities to 799 metres. The nitrate print that has resurfaced is 755 metres, but does include the two scenes that were cut by the Swedish censors. The film stock of the nitrate print shows that the intertitles, which are tinted and in both French and German, are from 1926, whereas the image material is from 1919, indicating that the print had a varied and long life (there is also an intertitle in French and Flemish). Consequently, it suffered the ravages of time, and in order to restore the film, the damaged nitrate print had to be digitized with great care (in 4K, colour, and overscan), including the perforations, many of which were torn or pulled. The image restoration consisted of several stages – stabilization, dust detection, and processing (configured according to each shot), the correction of possible resulting artefacts, and the use of a graphic tablet for remaining defects. Abundant scratches were also removed, and the digital restoration included colour grading and the insertion of recreated intertitles. Neither original title cards nor a Swedish list of intertitles survive. For this restoration, the film’s intertitles have been recreated using as a guide the studio’s German list of intertitles, preserved in the non-film collections of the Swedish Film Institute. The same design and font of intertitles from other films made by the same studio the same year have been used as a template. The editing of the resurfaced nitrate in the film’s final scenes has been corrected, using the title list and numbered copyright frames preserved at the Library of Congress in Washington, DC, as a guide. The digitization and image restoration was carried out by the CNC (Paris and Bois d’Arcy), and the reconstruction and re-creation of the Swedish intertitles by the Swedish Film Institute (Stockholm). cast: Egil Eide (Blom, operaio/worker), John Ekman (Holk, amico di Blom/Blom’s friend), Kaja Eide (moglie di Blom/Blom’s wife), Stina Berg (lattaia/the milk-bottle seller), Gabriel Alw (impiegato/the clerk). copia/copy: DCP, 36′ (da/from 35mm, b&w, col. [imbibito/tinted]); did./titles: SWE. fonte/source: CNC – Centre national du cinéma et de l’image animée, Bois d’Arcy.